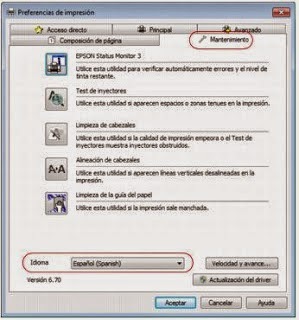 Learn here how change the language software to Epson printer L200. The Epson L200 printers are the most popular printers in Latin America, this is all thanks to its integrated innovative ink system, with this Epson risks a lot, and it is located between the first brands of printers that launched on the market a genuine printer ink systems. As we know that if a printer manufacturer cannot be all rosy, know that these printers ink is sold by them and have implemented codes in the pots of ink that unlocked the printer, you can get codes for reset but equally this machine has another peculiarity it is that only pays a lifetime without losing the warranty until it reaches fifteen thousand copies. After this it shows an error tank full of ink, you can see our publication how to eliminate the error tank full of ink in Epson L200 this is a quick solution to the case. Other factors that contributes to this printer it is the great interface that this one has what always characterizes an Epson is the case of the new software in which you can do anything since how to clean the print heads thoroughly when they are clogged among others. In the next post what we will do is to change the language of the software, it may not be very important but may happen we need it someday on these printers due to their dependent functionality of both the computer is necessary to have it in the most convenient language for us. Below we propose the information that you should read carefully to function properly, if this is a problem you just have, contact us through a comment. The next process is explained for printers with Windows operating system, if you need a configuration for printers in other operating systems request in a comment, you need to have the printer connected via USB to a computer also fully operational. This setup will be done from the computer and we can choose among English, Spanish and Portuguese languages also depend on the language you have available on the printer, this varies depending on where you buy the printer. We select in our computer where it says printers and faxes or printing devices everything depends on which operating system you have, it is normal that this option is on the second bar of the start menu in Windows. When we are in devices and printers or faxes we must locate our printer, for it we will see all devices are connected to the computer such as printers and select the option for our device, usually it will appear with letters printer Epson L200. If we have located our printer now begin to do the setup to do this you need to do a right-click on the printer when we do a right click a list of options pop and you can select the one called printing setting. As illustrated in the lower part of the image where it says Maintenance menu and select the language on your preference. After selecting this option all software is changed to Spanish or the language that we have selected for this to have an immediate effect it is necessary to restart the computer, in that moment the printer prompts you to make the changes of the ink pots in Spanish, even when a paper jam is presented messages on our computer screen will be in the language you have selected.